Wednesday December 1st 1897 I took up the carpet in the west room up stairs and cleaned the floor before noon. In the afternoon Will helped me clean the paper in the room down stairs and I put the carpet down. The boys finished husking and Leonard went to town tonight. I got the furniture in the north room after supper. This is Otts birthday. a good cold day for this time of year. Thursday December 2nd 1897 I took up the carpet in our room up stairs and cleaned the floor. I did work down stairs till three oclock when I put the carpet down again. I got the furniture in after supper. Frank Stevens was down to spend the evening. Friday December 3rd 1897 I was busy with the kitchen work all forenoon. Will helped me change the pictures in the afternoon. It snowed all day. The boys were busy most of the day taking care of stock. 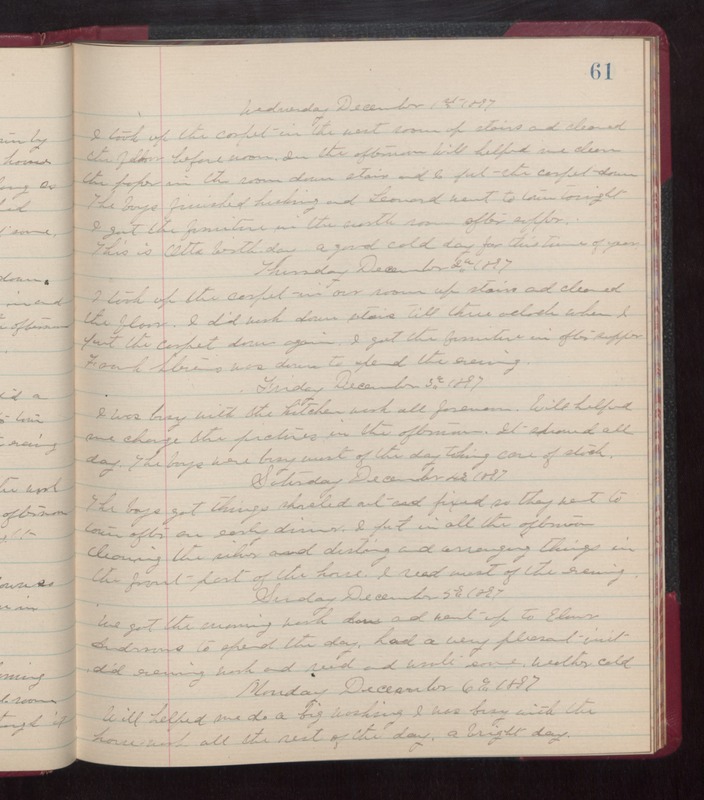 Saturday December 4th 1897 The boys got things shoveled out and fixed so they went to town after an early dinner. I put in all the afternoon cleaning the silver and dusting and arranging things in the front part of the house. I read most of the evening. Sunday December 5th 1897 We got the morning work done and went up to Elmer Andrews to spend the day. had a very pleasant visit, did evening work and read and wrote some. weather cold. Monday December 6th 1897 Will helped me do a big washing. I was busy with the house work all the rest of the day. a bright day.